Barbara Knox and Edward L. Williams are the site coordinators for this web site. Addition of information will be an ongoing project, so please check back often. All ideas, suggestions or contributions will be very welcome. If you have resource materials, please volunteer to do lookups and answer queries. You will be helping many people who have roots in Navarro County, Texas. The Navarro County Genealogy Society's quarterly meeting will be held on November 4th at 10:00 AM at the Nancy Roberts Room at the Corsicana Public Library, 100 N. 12th St. After the meeting session the program will be a show and tell. Participants should bring photos, family heirlooms, or documents and share their stories. No registration is required for this program. We did this successfully last year. It is fun to see and hear all the stories we have in our family history! Some of the most interesting show and tell last year was a multigenerational dress, a father's war helmet, books and dolls! The public is invited to come on and share their stories, come and bring a friend! For more information call 903-654-4808. 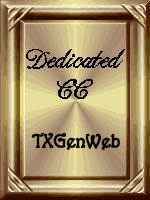 As of May 29, 2017, The Navarro County TXGenWeb site contains over 57,776 files with 29,721 entries in the Obituary Database. Many Thanks to all the submitters ! Misc articles on Cemeteries, Marker Cleaning, Visitation Rights etc. All rights reserved. Content on this website may not be archived, retransmitted, saved in a database, or used for any commercial purpose without the express written permission of Edward L. Williams. Neither the Site Coordinators nor the volunteers assume any responsibility for the information or material given by the contributors or for errors of fact or judgment in material that is published at this website.